Pre-school children experiment with and question the intriguing things they encounter. 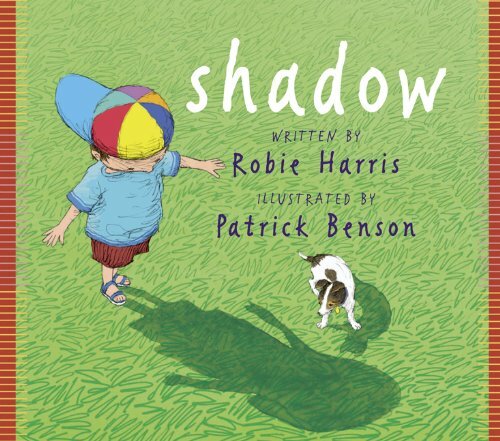 So it is no surprise that inspiration for Shadow came to Robie Harris after she had spent the day with a young child in a city park. She noted the child’s delight at the shadow following her, imitating her as she jumped and hopped, and then her sadness when the shadow disappeared. The book is written as if the child is talking and this gives it pace and energy. ‘Bet if I run away from it – it won’t get me. Woah! It’s running too!’ The illustrator, PatrickBenson of Owl Babies fame, was concerned to show how shadows actually behave at different times of day.To this end he made small cut-outs from cardboard and projected a light on them to help him show, convincingly, what the shadows would look like as a child might run, tiptoe, twirl and spin. So pictures and language combine to show a young child totally absorbed in playing with his shadow. This book would make a lovely gift as well as deserving a place on any nursery or reception class bookshelf.